Katya Petrovna: I can’t believe I’m here. This is incredible. Every now and then I like to bring up my fondness for simplicity, when it really works. 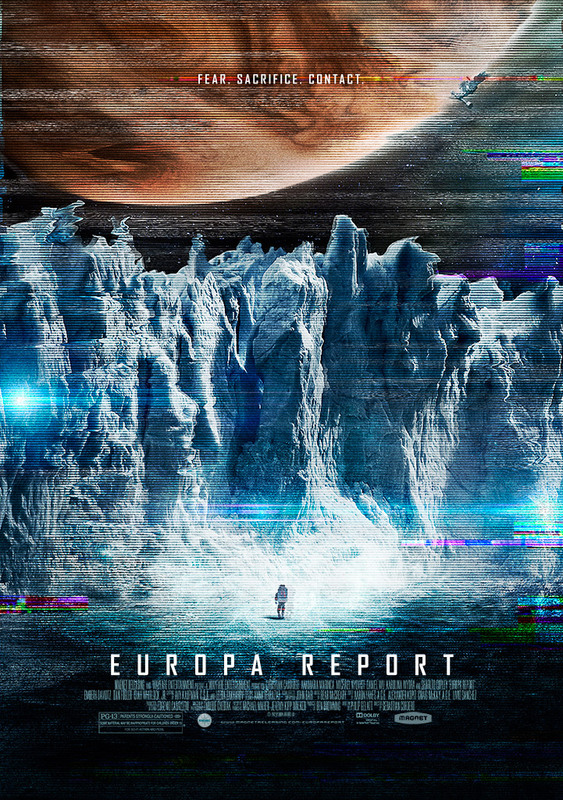 Europa Report is a science fiction film that is really stripped down to basics, using ideas similar to a film like Danny Boyle’s Sunshine and meshing them with a budget and approach similar to something like the indie film Monsters. The film could technically be classified as a thriller, but it works at being a story about people going on a mission and making smart decisions over the course of their journey, despite the drama that unfolds. 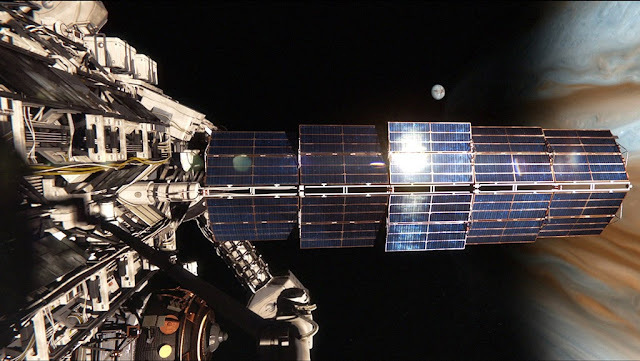 It fits into the ‘found footage’ style, as the cameras are all based around the idea that they are attached to the ship, space suits, or simply a part of the pseudo-documentary approach. All of these elements add up to a well-made science fiction story, which only suffers from offering little in the way of ambition. 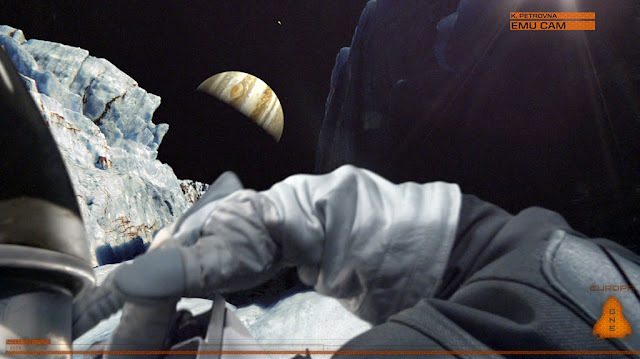 Set in an undisclosed time (I would assume the not-to-distant future), an international team of astronauts are sent out on a mission to Europa, one of the largest moons of Jupiter, which is believed to contain the potential of life underneath the sections covered in ice. The crew includes pilots William Xu (Daniel Wu) and Rosa Dasque (Anamaria Marinca), Chief science officer Daniel Luxembourg (Christian Camargo), Marine Biology Science officer Katya Petrovna (Karolina Wydra), and engineers James Corrigan (Sharlto Copley) and Andrei Blok (Michael Nyqvist). As the film begins, we are given a flash-forward in time to serve as our introduction, establishing that something disastrous will occur during this mission. We then spend the rest of the time watching events play out in order, with cuts back to a team of scientists (Embeth Davidtz, Dan Fogler, Isiah Whitlock, Jr.) discussing the mission on the day of launch. There is plenty that happens as the film continues on, but it is very notable that this 90-minute film (with credits) takes its time to really deliver on the more theatrical sides of its plotting. Tension is created in the moment and in its climax, but it is not really lingered on in the early goings of the film. Knowing that something will occur certainly provides an ominous feel, but Europa Report is more content with letting you live with these characters and understand where they are coming from, before the film challenges their purpose. It is the real definition of a slow burn and that will certainly throw off people expecting something pulpy, like Event Horizon, rather than something smaller and more character-focused, like Moon. 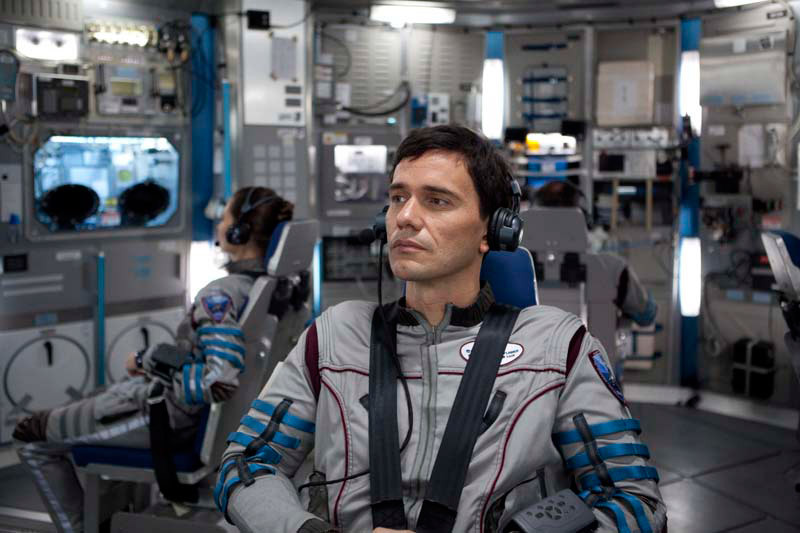 From a technical standpoint, Europa Report is quite the accomplishment. Made for what I would have to assume is quite a small amount of money, the film looks great. The work done inside the space module, in particular, has the kind of feeling that makes a viewer basically think they are seeing the real deal, until proven wrong. People floating around in zero-g continues to be impressive, the way protocol is observed and mixed with camaraderie makes sense, the film essentially does its best at being science fiction that presents science fact. As efforts are made to depict activity beyond just the space module, I can continue to commend the efforts of the crew, as having a limited budget definitely has one thinking on their feet as to how to make everything work overall. I am basically being vague in regards to how far this crew gets, but I can say that the film does justice to what it tries to accomplish. Director Sebastian Cordero (Cronicas) is certainly used to economical filmmaking, as this is his film with the largest scope yet, but that does not stop him from getting creative. It helps that he has a solid cast to work with. Having just watched Elysium, it is pretty great to see the range that Sharlto Copley provides, as he serves as the most charismatic member of the crew. The film does not necessarily need comic relief and Copley is not really filling that role, but he is immensely likable, which adds to the drama later on. Pragmatic to the fullest, I also enjoyed Michael Nyqvist’s work as essentially the counter-point to Copley, with the film putting him into some of the most interesting scenarios. 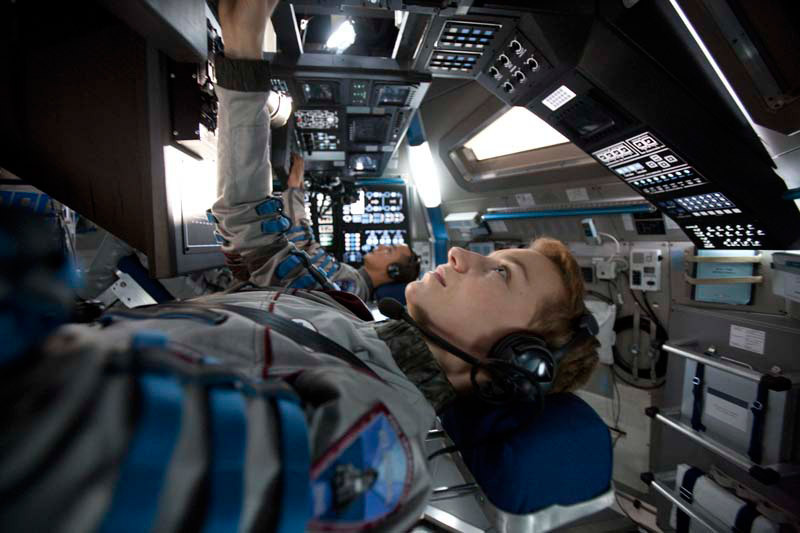 None of these performances are showy, which is something that can effect the overall feel of the film, in terms of its pacing, but also continues to emphasize how naturalistic a film about a space crew traveling to Europa ends up being. The fact that the film does emphasize its real human characters does work in the film’s favor when disaster does strike. I have been avoiding spoilers, but I think it is safe to say that at least one character does die in this film and during one particular death sequence, you cannot help but feel terrible for the situation that this person is in, despite what led up to this moment (it also presents a terrifying space scenario, which will sure to be seen again in the upcoming Gravity). 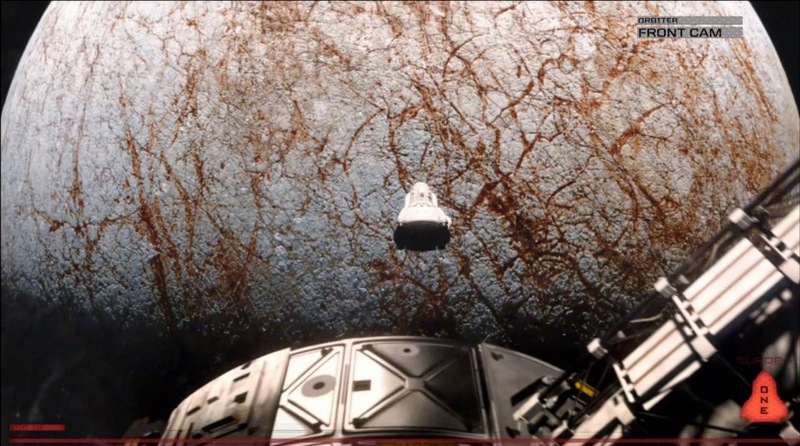 Given that the film is only allowing you to view these characters through the lenses of fixed cameras, it becomes all the more apparent that Europa Report has succeeded in bringing life to its very mechanical structure. It may be a bit thin on flashier content, but it still works regardless. There was a lot to admire about Europa Report. It is simple in nature, but effective in telling its story. The production has no need for glossiness, but looks great anyway (especially given its limited budget). And there is strong enough ensemble on board the ship, which helps to have this found footage feature do its best to make the whole thing compelling. The film is not reliant on an elaborate high concept and it does not bring a whole lot of “new” to the realm of science fiction, but it is an effectively made feature worth the time of people that appreciate solid sci-fi. James Corrigan: I thought I was trying to do something great for mankind. I thought it was worth the risk.